The main writing goal for last week was the completion of the first draft of my new science fiction novella, Leah (working title that has already been changed to something I’m not quite ready to reveal). A big push on Saturday saw me wrapping up pretty much all the edits a day early, leaving just a few loose ends to clean up on Sunday morning. Final word count for the story was 17,564 which just about pushes it into official novella length. Maybe it will get longer during editing, or maybe it will get shorter. Time will tell. I’m doing something a little bit different with Leah – beta readers. I’ve got three very kind volunteers who are going to read this early draft and give me feedback. This is the first time I’ve done anything like this so I’m looking forward to seeing how it goes. 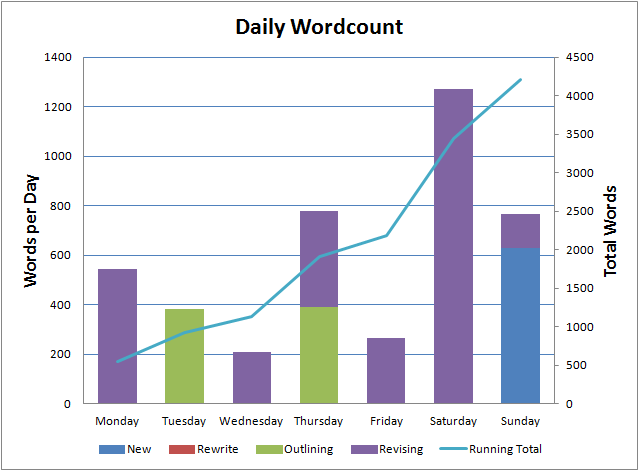 Total word count for the week was 4,215 which is very good considering how much of my time was spent revising. That said, I needed to make sure I had another project to roll into as soon as Leah was finished, so I also spent quite a lot of time outlining my next novel – currently known as The Zombie Book. Leah was completed pretty early on Sunday so I spent the rest of the day tinkering with the website, setting up a new newsletter signup page and a new Facebook page dedicated to my writing that will go live once I’ve managed to work out what to put in the header image. My word count for the day was pretty feeble though so, rather than watch a movie, I decided to get The Zombie Book kicked off. It was a little bit bumpy at first, and I ended up cutting a couple of hundred words almost immediately, but as I said on Twitter, the new book is underway. I’ve done a lot more outlining of the book this time, including some very brief character profiles, and I’m hoping that will stop me going straying off the beaten path too much. Both The Ghost Smuggler and Glitch needed some fairly extensive structural fixes. I’m hoping to avoid such dramatic rework this time round. The Zombie Book is, of course, just a working title. I do have a real name for it picked out but I’m keeping that close to my chest for the time being. Spoilers. Of course, I should really have been working on the final revisions of the next draft of The Ghost Smuggler but I have an editor lined up to take a look at the first few chapters of this book so I need to get them down on paper in time for me to beat them into some sort of reasonable shape.